Banjo master, Butch Robins, (formerly of Bill Monroe's Blue Grass Boys, Newgrass Revival, Leon Russell Band, Charlie Moore and more....) has just released two new singles for the holiday season. The first, "Holiday Toast" is an original composition written and played by Butch on banjo and treats listeners to a rare solo vocal performance by him as well! The second is Butch's arrangement of the classic Leroy Anderson tune, "Sleigh Ride", featuring the wonderful singing of Nashville's Kathy Chiavola! Feller and Hill are proud to bring you a brand new song, written by Tom T. and Dixie Hall called "Government Blues". The song is a light-hearted look at a depression-era problem that can just as easily translate into today's situations. Feller and Hill deliver in their vintage style. Asheville, NC -- Roots-music troubadours Donna the Buffalo are excited to release a music video for the song “Working On That” written by DtB co-founder Jeb Puryear for their new album Tonight, Tomorrow and Yesterday. Donna the Buffalo has been making socially conscious music for the last 25 years. Of this song, Puryear states, "There is a growing cross section of good people, crossing all lines of race, border, religion and economics that will triumph. Their triumph will have no loser, for the victory is peace." Mountain Fever Records is proud to announce the new bluegrass single release, “Pike County Jail” written and performed by Dave Adkins. The song was co-produced by Dave Adkins and Edgar Loudermilk and mixed by Aaron Ramsey of Mountain Heart, and Mountain Fever Studios, and mastered by Brandon Hodges of Dead Oak Mastering. "Pike County Jail" is the first single from Adkins upcoming solo album, Nothin to Lose releasing early 2014. Lou, Christy, Trevor and Skip..along with Ron Stewart on fiddle." The song is available for purchase at loureidandcarolina.com and available to radio programmers at AirPlayDirect.com. "Christmas in the Blue Ridge" was written by Lou and Terry Foust. The song is performed by band members Lou Reid (lead vocal, mandolin), Christy Reid (vocal, bass); Skip Cherryholmes (guitar, vocal); Trevor Watson (banjo) with guest Ron Stewart (fiddle). 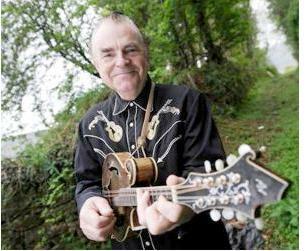 The Irish Godfather of Bluegrass Music, Niall Toner, continues to entertain and perform between two continents. Music from the Blackstairs Mountains of Ireland blend the Irish flavor and American bluegrass into the Niall Toner sound. A serious follower of the Bill Monroe style of mandolin, the award winning artist will be performing at next year's MerleFest. Toner has released a new video from his Onwards and Upwards album released last year. Just letting you know that the Urban Monroes have released a new Bluegrass Christmas single entitled "Underneath The Stars." It is an original that also appears on the Menards Retail Stores Holiday CD back in the Midwest. Lorraine Jordan & Carolina Road to Debut Video "That's Kentucky"
Nashville, TN: A music video for "That's Kentucky", the latest chart-topping single from Lorraine Jordan & Carolina Road's self-titled album from Pinecastle Records was unveiled Friday, November 8, on the band's YouTube page. The single is number one on Bluegrass Today's Weekly Airplay Chart for the third consecutive week, and it also debuted at number one on Bluegrass Today's Monthly Airplay Chart. Watch the video below. Read more about Lorraine Jordan & Carolina Road to Debut Video "That's Kentucky"
North Carolina's Ash Breeze Releases First Single "Without Love"
Willis, VA -- The first quarter of 2014 is set to introduce the bluegrass and Americana worlds to the exciting new sounds of North Carolina natives Ash Breeze (formerly known as The Smith Family) with the release of their self-titled debut album on Mountain Fever Records. The first single from the album, "Without Love," produced by Aaron Ramsey (Mountain Heart) releases to radio yesterday. Read more about North Carolina's Ash Breeze Releases First Single "Without Love"
Cracker Barrel Old Country Store® and Mandy Barnett announce the release of I Can’t Stop Loving You: The Songs of Don Gibson, Barnett’s newest CD, which will be available on November 11 at all Cracker Barrel Old Country Store® locations, online at www.crackerbarrel.com and select digital retailers. The release, produced by Barnett, features 12 songs written by Country Music Hall of Fame inductee Don Gibson. The album’s debut coincides with the 10th anniversary of Gibson’s death on November 17, 2003, and fulfills a promise that Barnett made to the legendary singer/songwriter. Franklin, TN -- The brand new single, "More Life," from 2013 Emerging Artist of the Year nominee Darrell Webb and Queen of Bluegrass, Rhonda Vincent, was released yesterday. Webb's upcoming 2014 release features an all-star lineup of some of the industry's biggest names including Vincent, Blue Highway, Daily & Vincent, The Grascals, J.D. Crowe, Doyle Lawson, Lonesome River Band and Wild Fire and produced by ground-breaking musician and bluegrass producer Jim VanCleve, from Mountain Heart fame. Nashville, TN: "That's Kentucky", the latest single from Lorraine Jordan & Carolina Road's self-titled album from Pinecastle Records, debuted at number one on Bluegrass Today's Monthly Airplay Chart. The tune logged 968 total spins in October. "That's Kentucky" has also been in the top spot for the last two weeks on Bluegrass Today's Weekly Airplay Chart. Here it is, friends! It’s the companion video for The Grascals' song “American Pickers” which appears on When I Get My Pay (street date November, 19). Yep, those are our pals Mike Wolfe from the History Channel TV show American Pickers and superstar/all-around-good-guy Dierks Bentley making guest appearances. The Grascals commented, "We love those guys! Whatcha think???" Jim & Valerie Gabehart Single "I Was Raised In A Railroad Town"
Jim & Valerie Gabehart released the single "I Was Raised In A Railroad Town", the title cut from their latest project. Released to reporting radio stations, the single features Lead vocal and Guitar-Valerie Gabehart; Harmony vocal and Banjo-Jim Gabehart; Mandolin-Brandon Shuping; Harmony vocal and Bass-John "Buckwheat" Green; and Fiddle-Steve Thomas. Stations can also acquire the single from AirPlay Direct. Read more about Jim & Valerie Gabehart Single "I Was Raised In A Railroad Town"
Asheville, NC -- Jose' Martinez, our beloved drummer of the past 12+ years and dear friend, has decided to retire from the road and is currently living and performing in Seattle, WA. We wish Jose' all the best with his future. With that, the band is happy to welcome the young and talented drummer, Alwyn Robinson, into the Leftover Salmon family. Alwyn has been playing with the band for the past few months and the fit couldn’t be better; it’s time to make it official. "Alwyn not only fills Jose’ Martinez's shoes but his incredible chops and ears are going to propel the next era of Salmon’s growth.” says Vince Herman, “Look out."